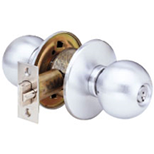 Arrow’s H Series Grd 1 cylindrical knob locks have been engineered for years of dependable operation. They’re offered in a complete range of functions and finishes and can be purchased with either conventional or SFIC cylinders. Latchbolt operated by knob either side except when outside knob is locked by key outside or pushbutton inside. Key outside locks or unlocks outside knob. Unlocked by turning inside knob, closing door or using key outside. 2-3/4" (69.85 mm) backset standard. Brass with 1/2" (12.7 mm) throw. 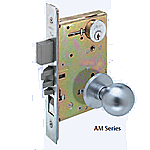 Latch housing is steel, zinc dichromate finish for corrosion resistance. 1" (25.4mm) bore in edge of door required. Brass,bronze or stainless steel. ANSI A115.2, 4-7/8" (123.82 mm) x 1-1/4" (31.75 mm) curved lip standard. Solid brass, 6 pin cylinder with Arrow“ A” keyway. 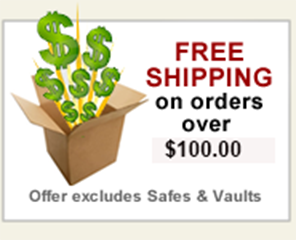 Can be masterkeyed, grandmaster keyed and construction masterkeyed. Conventional cylinders also available in a variety of competitive manufacturer’s keyways. Supplied with two 6 pin nickel silver keys.